HP Lovecraft wrote, "ocean is more ancient than the Mountains and freighted with the memories of time." 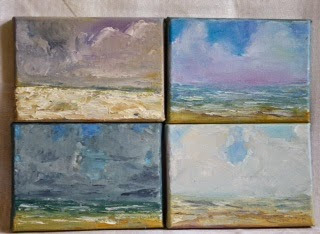 Set of four paintings. Each 5x7x3/4 inches. Painted in oil with a palette knife on gallery wrap canvas. Winter, below Fall. Upper right Spring, below right Summer.